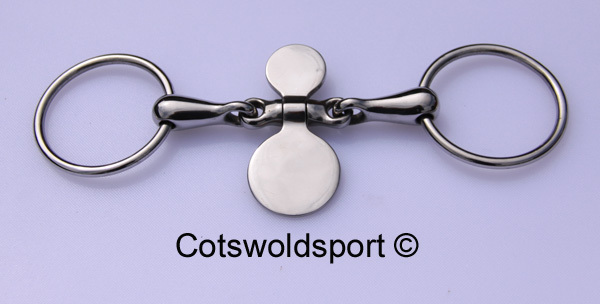 The Cambridge mouth rugby pelham is also sometimes known as a low port rugby pelham, and can be good to use on horses with a large tongue or small mouth. The low port of this pelham bit gives space for the tongue, with no collapse on the bars and no real palate pressure. 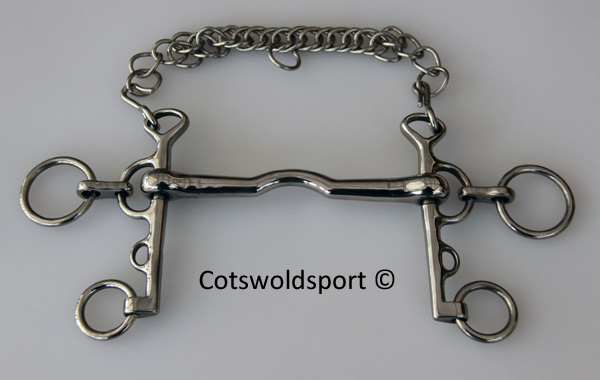 Rugby pelhams are designed to be used with two reins, the 'snaffle' rein on the larger ring which should have a constant contact, and the curb rein is attached to the smaller loose bottom ring and is used when needed. The small hole in the shank just above the curb ring is for a lip strap, not essential but correct for showing and helps to keep the curb chain flat.